made it way to complicated. dumb down the sentences when explaining dynamics so it is easier to understand please. Highly detailed. Took me much longer than one hour. 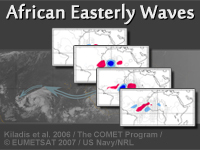 Definitely increases my knowledge and understanding of African Easterly Wave development, along with their characteristics, in general.